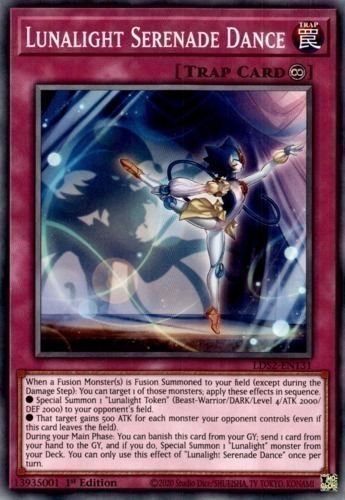 When a Fusion Monster(s) is Fusion Summoned to your field (except during the Damage Step): You can target 1 of those monsters; apply these effects in sequence. ● Special Summon 1 "Lunalight Token" (Beast-Warrior/DARK/Level 4/ATK 2000/DEF 2000) to your opponent's field. ● That target gains 500 ATK for each monster your opponent controls (even if this card leaves the field). During your Main Phase: You can banish this card from your GY; send 1 card from your hand to the GY, and if you do, Special Summon 1 "Lunalight" monster from your Deck. You can only use this effect of "Lunalight Serenade Dance" once per turn.